• The story of the Celts and their culture is being explored in a new exhibition which opens at the British Museum in Bloomsbury today. Celts: Art and Identity, being run in partnership with National Museums Scotland, is the first British exhibition on the Celts in 40 years. Highlights of the display include a hoard of four gold torcs found at Blair Drummond in Stirling in 2009, Christian artefacts including iron handbells used to call people to prayer, elaborately illustrated Gospels, carved stone crosses and, a gilded bronze processional cross which, dating from 700-800 AD and coming from Tully Lough in Ireland, will be on show for the first time in Britain. 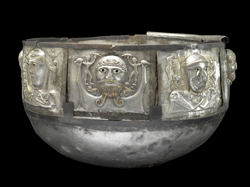 Also present will be the Gundestrup cauldron, which dates from 100 BC-1 AD and comes from Denmark (pictured), London artefacts such as the Waterloo helmet and Battersea shield, and works created more recently which reflect on an often mythical Celtic past such as George Henry and Edward Atkinson Homel’s 1890 painting The Druids: Bringing in the Mistletoe. Runs until 31st January in the Sainsbury Exhibition Gallery (Room 30). Admission charge applies. For more, see www.britishmuseum.org. PICTURE: © The National Museum of Denmark. • A new exhibition exploring the myth and reality of the ‘fallen woman’ in Victorian Britain opens at the Foundling Museum in Bloomsbury tomorrow. The Fallen Woman features works by artists including Dante Gabriel Rossetti, Richard Redgrave, George Frederic Watts and George Cruikshank, displayed alongside stereoscopes and depictions of the fallen woman in the era’s popular media. It also looks at the petitions of women applying to the Foundling Hospital, bringing to life the real ‘fallen women’ of the period through a specially-commissioned sound installation by artist and musician Steve Lewinson. The exhibition runs until 3rd January. Admission charge applies. For more, see www.foundlingmuseum.org.uk. • The London Transport Museum’s Depot in Acton hosts its autumn open days this weekend. The day includes the chance to see the original printing blocks used for the Johnston font – London Transport’s iconic typeface, expert talks on transport vehicles, a chance to see how the moquette – the seat covering on the tube – is made and film screenings from the LTM archive. From 11am to 5pm Saturday and Sunday. Admission charge applies. For more, see www.ltmuseum.co.uk. • The Worshipful Company of Woolmen will be holding their annual sheep drive across London bridge this Sunday. The event, free to watch, kicks off at 10am and runs until 5pm. For more, see www.woolmen.com. • On Now: Ai Weiwei. This landmark exhibition at the Royal Academy of Arts in Piccadilly celebrates the work of Honorary Royal Academician and leading Chinese artist Ai Weiwei with significant works from 1993 onwards and new, site specific installations. Among the key exhibits is Straight (2008-12), a body of work related to the Sichuan earthquake of 2008, fabricated from 90 tonnes of bent and twisted rebar which was collected by the artist and straightened by hand. Runs until 13th December. Admission charge applies. For more, see www.royalacademy.org.uk. The Foundling Museum in Bloomsbury was a brilliant idea, so it invites studies of Victorian family life in all its economic and social complexities. But The Fallen Woman concept involves other critical elements, like gender and religion. The paintings by Dante Gabriel Rossetti, Richard Redgrave, George Frederic Watts and George Cruikshank show heartbroken, romantic women. Although I love these paintings, the petitions of women applying to the Foundling Hospital bring to life more accurately the real fallen women and their innocent children.